I know I post a lot of luxury items on the blog, so every once in a while I like to share a few favorites that are a little more budget-friendly. Whether your bank account needs a break (like mine) or you’re just trying to find looks for less, here are some of my faves for spring under $150. The one thing I’m definitely missing from my spring wardrobe is a good pair of distressed denim shorts. They look great dressed up with a fabulous blazer and pumps, but are very easy in a tank and sandals too. Also loving these colorblock sandals from Topshop! They would go with everything. I know my friends would definitely get on board with this tee too. I need a pair of distressed denim shorts, and greats picks I love everything. 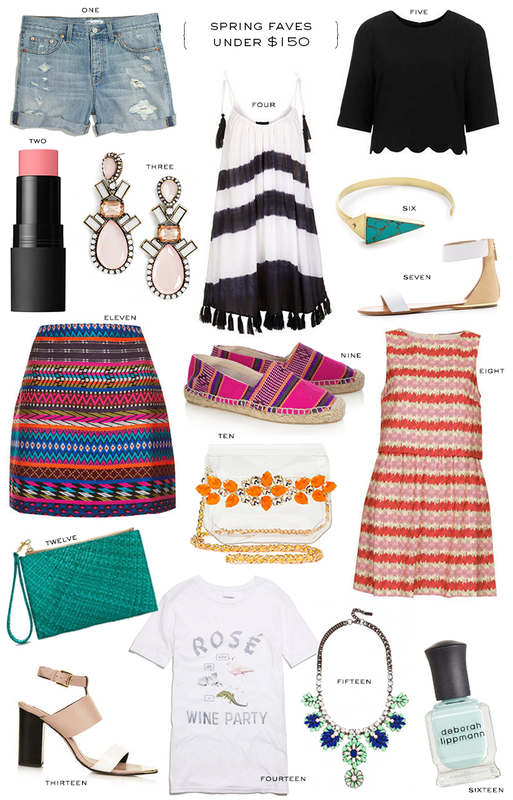 Great pieces, my two favorites are from TopShop–the scalloped tee and skirt! These are awesome picks! Thanks for sharing…I love all of your luxury stuff but it definitely isn’t attainable for me right now! Still great inspiration, though! I love that black and white tie-dye tassel dress! It would make a perfect coverup! I pick #5! Well.. really.. I pick them all..
Love all of the patterns, colors and textures! Can’t wait to get some pastel colors on my nails! Loving this color palette. I have been eyeing those J.Crew flats! And that minty polish is gorge! Lovely picks as always. distressed denim shorts are among my favorites and one of those items I keep buying and now have too many. I’m loving both pair of sandals, those blush earrings and that crop top is fab. That is the cutest tee shirt ever! And I can never have enough pairs of comfy denim shorts…they are my summer uniform! Great pieces under budget! The Topshop sandals look like my Elizabeth and James pair, so I may have to snag them . wtf! that fringe dress is amazing…excuse my french! I love this Merritt! Thank you! Especially those shorts and the skirt. Such a happy and bright round up! Loving 9, 11, and 15! Ohhh! Love 9 and 12! So pretty! I’ve been trying to reel in my spending, too, so all of these picks are on point, but my heart skips a beat for those striped espadrilles. Hello, spring/summer!